Liberal held off Hays 46-38 Friday night in a rugged and physical game. 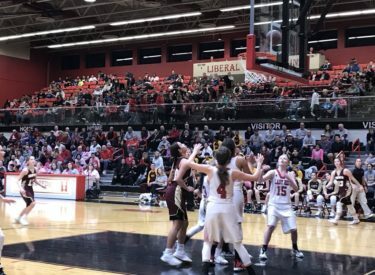 The Lady Redskins won in front of a big homecoming crowd to avenge their only loss of the season. The Lady Red won despite only 10 field goals on the night as they were 10-34. But Liberal was 24-33 at the foul line while the Lady Indians were 10-13. Hays led 11-4 early and 11-6 after one quarter. The Lady Skins led 20-18 at the half. Hays led 30-24 in the third and led 30-25 at the end of three. Liberal went on runs of 9-2 and 11-3 to lead 34-32 at the 5:02 mark and 36-33 at the 3:38 mark before a Hays three point play tied the game at 36-36. LHS took a 37-36 lead after Audrey Gilmore made a foul shot. Aubrey Warden’s emphatic blocked shot led to a Liberal 3 on 2 break and a Katie Horyna three point play to give Liberal a 40-36 lead with two minutes to play. Horyna scored a career high 19 points and was 12-14 at the foul line. She scored 15 in the fourth quarter. Machia Mullens had 12 points. Liberal is 15-1 and 4-1 in the WAC and Hays is 10-6 and 4-1 in the WAC. Liberal plays at Cimarron Tuesday night at about 6:30 on 1270 and kscbnews.net.